Israeli soldiers invaded, on Wednesday at dawn, two Palestinians in the northern West Bank city of Jenin, after invading their homes and searching them. 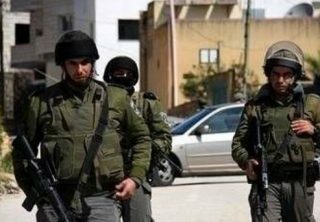 The Jenin office of the Palestinian Prisoners Society (PPS) has reported that the soldiers invaded the Eastern Neighborhood in Jenin, and kidnapped Abdul-Rahman Sanouri, and Mohammad Shehab Sanouri, 44. It added that Mohammad is a former political prisoner who was held by Israeli for fourteen consecutive years. Also at dawn, the soldiers kidnapped 33 Palestinians in Silwan town, and one Palestinian in Sheikh Jarrah, in occupied Jerusalem. The soldiers also kidnapped one Palestinian in Bal’a town, in the northern West Bank district of Tulkarem, and five Palestinians, including a woman, in Hebron, in the southern part of the West Bank. In addition, the Palestinian Health Ministry in Gaza has reported, Wednesday, that a Palestinian woman, who was shot by the Israeli army 15 years ago, died after succumbing to her wounds. On Tuesday, many armored Israeli military vehicles, accompanied by D9 bulldozers, invaded Qalandia town, north of Jerusalem, and demolished twelve homes.